Great Smoky Mountains National Park’s Mountain Farm Museum at Oconaluftee Visitor Center will see new growth this summer with the construction of a garden fence to keep elk out of the crops. The historically accurate fence is made possible by a $5,000 grant from the Blue Ridge National Heritage Area Partnership awarded to Friends of the Smokies. 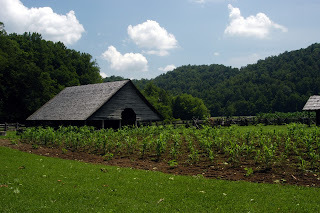 Historic fence styles at the Mountain Farm Museum display how Appalachian farmers from the late 1800s to early 1900s protected crops from pests, divided boundaries, and managed livestock. The installation of the new “snake” style fence will prevent the wild elk herd currently living in and around the park from entering and trampling the garden, enabling visitors to continue to see Cherokee heirloom vegetables, Hickory King Corn, broomcorn, and sorghum. "We are grateful to the Blue Ridge National Heritage Area for this grant," said Park Ranger Lynda Doucette. "With the funds provided, we can protect our crops from damage and continue to provide visitors with opportunities to learn about our agriculture heritage." The fence will be constructed using locust logs over the course of several volunteer workdays. The next workday will be on Saturday, June 10 from 9:00 AM-4:00 PM and is open to the public. Interested volunteers should meet at the Oconaluftee Visitor Center in the morning for a briefing, followed by a day of lifting 25-35 lb. rails and stones. Water and Gatorade will be provided. Participants should wear sturdy shoes, clothing, and a hat.